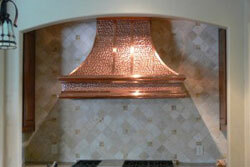 Copper Vent Hood is also known as Extractor Hood or Copper Range Hood. Exhaust fan is used in the copper vent hoods to through out the moisture, heat, odour, smoke and other unwanted things from air by filtration and evacuation. 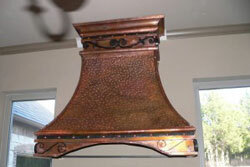 Copper vent hoods are most useful for kitchen as these unwanted things are produced mostly in kitchen. 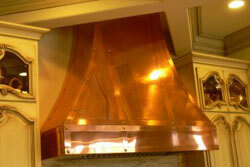 Because of this function vent hood is more essential part of kitchen but it can butify your kitchen when you will add copper to it. 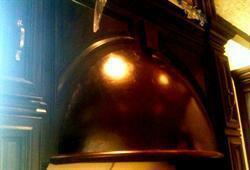 When you will use copper vent hoods then it will do it s function along with butification of your kitchen. 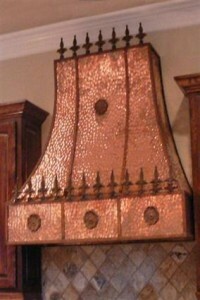 Because of this feature and antique feel copper vent hood is in more demand. 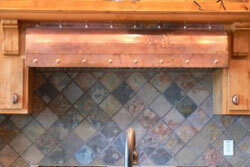 Copper is the most durable metal so the design on it will be forever which will beautify your kitchen. 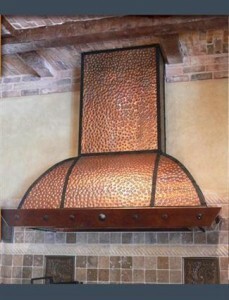 On copper vent hoods more designs could be integrated. 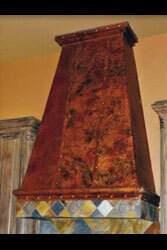 Our copper vent hoods are completely handcrafted by Master craftsmen in Texas and miled in Mexico and Chile to give you best and beautiful copper range hoods. 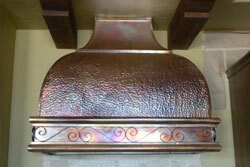 We can customize copper range hoods according to your reference. 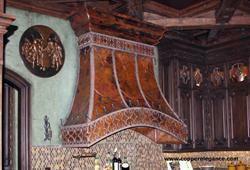 If you are looking for best and beautiful Copper Vent Hood / Copper Range Hoods then call Gregg to discuss more on the number given above. 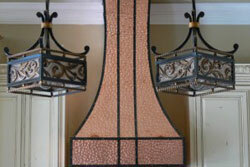 If you want to add long-lasting beauty of copper to your place or some metallic dazzling effect then consider copper. 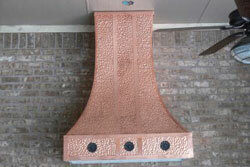 Copper is a hot commodity with good price, when you will use copper range hoods / vent hood in your place it will add its own effect. 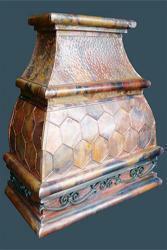 We have handcrafted and artistic copper vent hoods with professional designs on it, all you need to decide what type of Copper Vent Hoods / Range Hood you want. 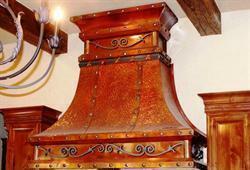 We have different styles of copper vent hoods such as chimney effect, large base etc. 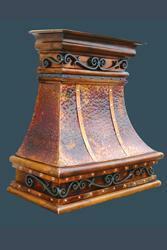 We have modern rounded or square copper range hoods without narrow chimney effect also. 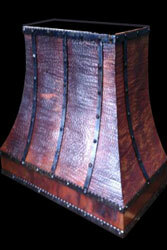 We can give you whichever you want depending on your choice. 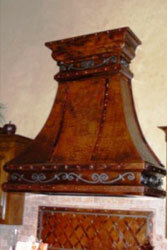 Copper Vent Hood price is also a considerable factor when buying. 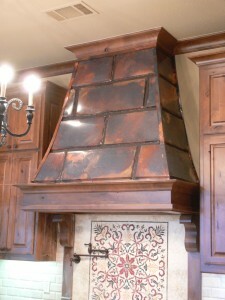 The price will depend on size and decoration of the copper vent hood / range hood. 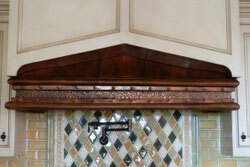 But we can assure you best market price in the class. 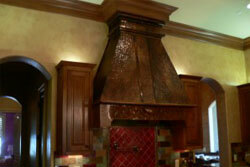 Our copper vent hoods experts are not only designers but innovators of vent hood and range hoods. 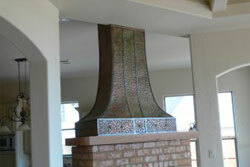 We have best team from design to management of the vent hoods and other products. 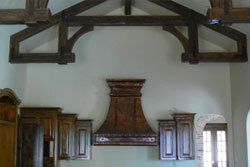 Above vent hoods are available in all standard finishes, you may choose shape, size, and border according to your requirement. 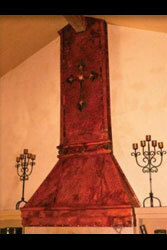 Our custom range hoods and vent hoods are available for all the requirement like wall mount and under cabinet. 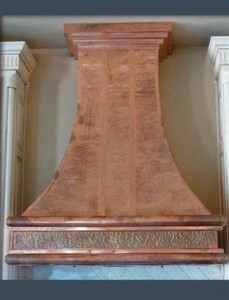 If you are ordering for in-stock vent hood then we may deliver quickly or as we offer customized copper range hoods also it may take some time. 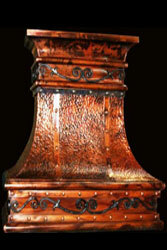 You can contact us to know more about pricing offer and delivery time for your products.